Things you will need: Cardboard, duct tape, wire, plaster cloth, rope, mod podge, rubber latex, paint. 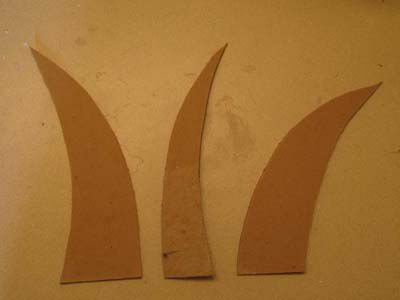 Start buy cutting out the following 3 shapes for each horn. 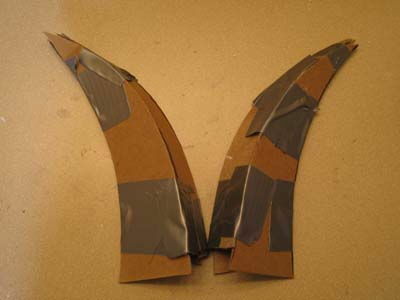 Once you have cut out the shapes, piece them together and use duct tape to hold the finished shapes in place. Wrap the horns with wire, I am using simple flower arranging wire. The Wire serves to add some grip so it is easier to cover with plaster cloth. Wrap the horns in plaster cloth. 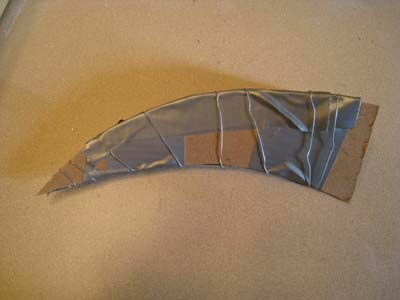 This will smooth out the horn shape for you and make it easier to work with. Take your rope and wrap it around the horns. I use a dab of glue to hold the ends of the rope down. 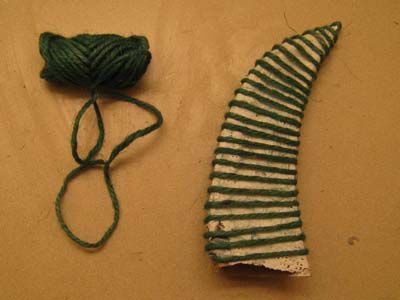 Take your time and make sure the rows of rope are evenly wraped for a more even looking horn. 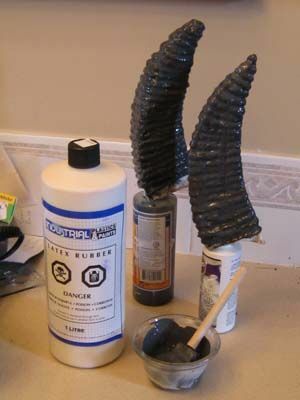 Coat your horns with several layers of modpodge, allowing for ample drying time between coats. This process can take up to a week. 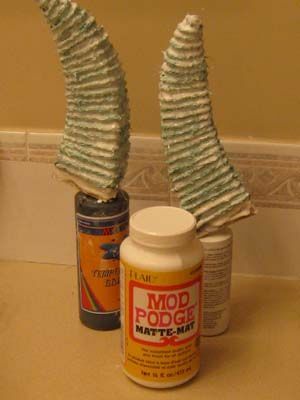 I recommend at least 5-10 coats of mod podge. Now it is time to add Latex. 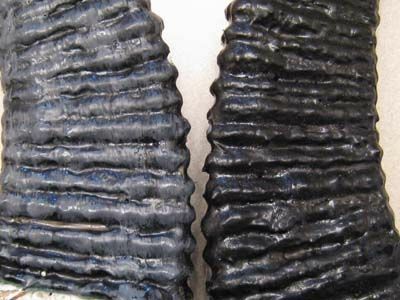 I am mixing in black paint to the latex prior to coating, this way the color is even all the way through. Latex dries darker than it mixes, so keep this in mind if you have a specific color you desire, you can test the latex prior to coating by spreading a thin layer on a sheet of paper and letting it dry. Again, you will need to add several layers of latex, I reccomend at least 10 coats. 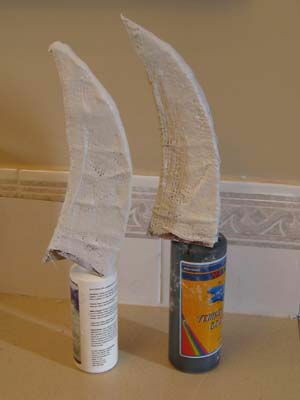 Once the horns are throughly coated, you may add detailing and other painting as desired. I have dry brushed a lighter grey to the horns to add some depth. As you can see, the dry brushing adds a nice punch to the finished horns. You may at this time add some sealant or varnish of your choice. 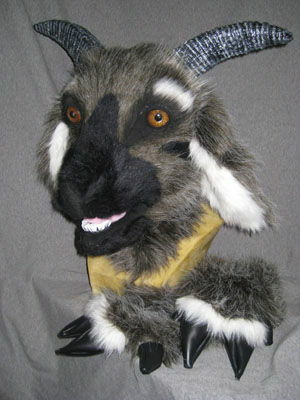 You may install your horns in several ways; You may drill some holes in the edge and sew them into the suit head, install wire and wire them into the head base, use hot glue or any combination thereof. Congradulations! Your horns are done!